Everything but the smell. Looks real and disgusting. Soft plastic. 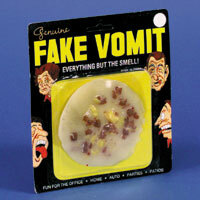 4 inch fake vomit. $15.40 per dozen for 8 dozen or more. $13.60 per dozen for 24 dozen or more.